Make reservations at your own table for an easy romantic dinner at home this Valentine’s Day. Even if you’re not an experienced cook, Grilled Steak and Shrimp Scampi makes it simple to delight your sweetheart with a homemade feast. Set out the linens, light the candles and serve this restaurant quality dish in under an hour. No grill? No problem! This Steak and Scallop Recipe shows you how to prepare steak in a skillet too. 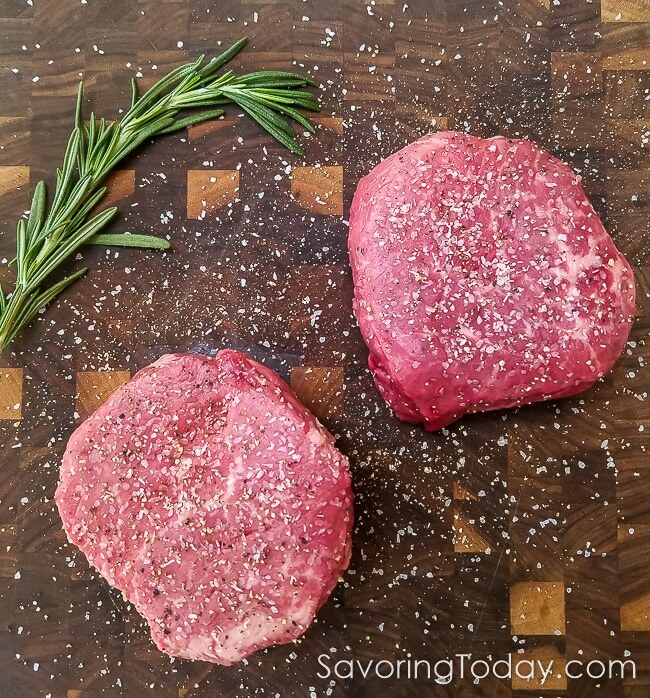 Tenderloin steak (often sold as filet mignon) was selected for this recipe because it is the most forgiving cut of steak; it is tender even if overcooked. It’s also a very lean cut of beef (little marbling or fat), so it is ideally paired with the rich, buttery scampi sauce. What to look for: A soft, uniform steak with even thickness (about 2-inches) and some marbling (the thin white marks within the muscle), if possible. Note: Filet mignon is the trimmed, smaller end of the tenderloin. Even though the filet is from the same primal cut, it is more expensive than tenderloin steak cut because of the added labor of trimming. Ribeye, T-bone or Porterhouse (the tenderloin and strip steak in one), Kansas City or New York strip steaks are reliably tender and juicy when cooked to medium-rare. These cuts have more fat and marbling which means more flavor and less need for rich sauces. In fact, the ribeye is our favorite summer griller with our Smoked Chile Rib Rub—oh how we love summer! However, they all work with this recipe and taste great with the scampi sauce on the side so the flavor of the meat can shine. A well-marbled steak (lots of thin white marks within the muscle) at least 1 1/2-inches thick, preferably with only a 1/4-inch of fat on the outer edge. Less fat around the edges means fewer flare-ups on the grill. Simply trim the outer layer to 1/4-inch, if needed. Flap steak (bavette), hanger, flank, flatiron and tri-tip steak deliver on flavor at a lower price point, depending on regional markets. These steaks are trickier for the beginner due to the unique muscle structure of each one. Even though these cuts require “just right” doneness and careful carving for satisfying results, they are worth it! Learn more about these worthwhile, flavorful grilling steaks here. Following the cooking time on a recipe for grilling steak is just plain risky. No two steaks are exactly alike and grilling equipment varies widely, so following time and temp is rarely spot-on. Do you really want to take chances with those beautiful steaks you just bought? The only way to really know when a steak is done is to know what’s going on inside with an instant-read thermometer. Get the most accurate reading by insert the probe into the center of the steak straight in from the side, not the top. This way, the entire part of the tip reading the temp (models vary) is at the same level. ThermoPop is reliable and reasonably priced—it’s the one I use myself. An instant-read is not the same as a leave-in meat thermometer. An instant–read thermometer is a multi-use gauge, providing a reading within 5 seconds. Its thin shaft makes it easy to insert in dense meats and won’t damage fine baked goods. A leave-in meat thermometer has a thicker, stable shaft to remain inserted during cooking when roasting meats. Pairing a single wine to complement both grilled steak and seafood is challenging because you’re not sure whether to go with a bold Cab or a crisp Pinot Grigio. I cook with wine often, so I have no problem opening two bottles at one time, but here’s how to choose just one for this dish. To select just one good bottle, follow these steps to narrow it down. Decide which is your favorite—red or white. If red, go for a lighter red wine like a Pinot Noir or Zinfandel, or one of these 11 other common varieties to complement the steak without covering up delicate seafood flavor. If white, reach for full-bodied, layered white wine with acidity like a Chardonnay, Viognier (“Vee-own-yay”) or Champagne that can stand up to grilled steak and rich sauces. 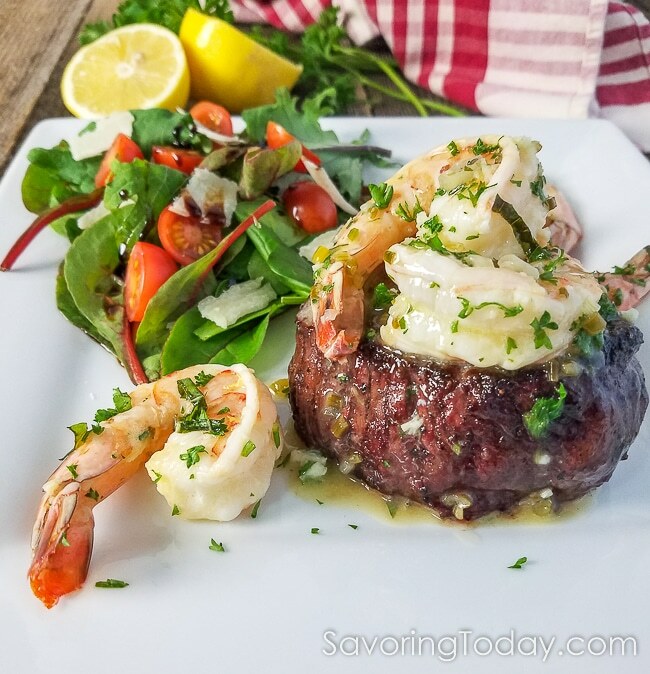 Savory grilled steak tenderloin topped with a buttery, garlic-infused scampi sauce and shrimp. Cooks in under 30 minutes for an easy, date night dinner. Prep all the ingredients before starting so the steak and shrimp will be ready to serve at the same time. Generously season both sides of the steaks with sea salt and pepper. Allow to sit at room temperature for 40 minutes before grilling to allow the salt to penetrate the meat. Heat the grill to 450° for 10 minutes. Just before placing the steaks on the grill, drizzle with a little olive oil. Place steaks on the grill, reduce heat to medium, and cook for 4 to 5 minutes with the lid closed. Steaks should sear and register dark grill marks. Drizzle with more olive oil and turn steaks over to cook an additional 4 to 5 minutes or until desired doneness is reached (130-135°F for medium-rare, 135-145°F for medium or 145-155°F for well-done). If the steak is browning too quickly or charring on the edges before it reaches the desired internal temperature, turn heat off on one side of the grill and transfer the steaks over to continue cooking over indirect heat until desired temperature is reached. Important: Insert the thermometer into the center of the steak from the side, not the top, for a more accurate reading. This way, the entire part of the tip reading the temp, which varies by model, is reading from the same area. Use a chimney starter to light natural lump charcoal. Once the coals are glowing hot and ready, spread them out over one side of the bottom of the grill. Just before placing the steaks on the grill, drizzle with a little olive oil. Place steaks on the grill grate directly over the coals, place the lid on the grill with the vents open and cook for 4 to 5 minutes. Steaks should sear and register dark grill marks. Drizzle with more olive oil and turn steaks over to cook an additional 4-5 minutes or until desired doneness is reached (130-135°F for medium-rare, 135-145°F for medium or 145-155°F for well-done). If the steak is browning too quickly or charring on the edges before it reaches the desired internal temperature, transfer steaks to the side of the grill away from the coals and continue cooking over indirect heat until desired temperature is reached. => Transfer steaks to a warm platter, tent with foil and allow to rest for 10 minutes while preparing the scampi. In a medium skillet, sauté the chopped green onion in the olive oil over medium-low heat for 2 to 3 minutes. Add the minced garlic and cook anotehr minute, until fragrant. Increase the heat just a little and stir in the wine and lemon juice, simmer for 2 minutes to reduce slightly. Reduce heat back to medium-low and add the butter. Once the butter melts, add the shrimp to the skillet and cook until pink and plump (about 3 minutes), turning as needed. Stir in fresh parsley, lemon zest, basil, and hot pepper sauce. Serve the shrimp and scampi sauce over the grilled steak as a garnish or on the side. Total Time includes the time to salt steaks and light grill. Salting the steak: It takes at least 40 minutes for the salt to draw moisture and then be reabsorbed into the meat. Either salt when you have the time to let it sit (40 minutes to 24 hours) or salt right before placing it on the grill. Like Kosher salt, flaked sea salt will dissolve more easily than ground sea salt. Thinner steaks take less time to grill, so check temperature 1-2 minutes after turning. Buying shrimp already peeled and deveined will save prep time or you can use a Shrimp Deveiner and Cleaner Tool to make it easier. Make the Scampi without wine, substitute the wine with chicken stock. This looks like the perfect combo. And that steak! Simply mouth-watering. What a special dinner! This looks great! In the directions for the shrimp scampi, it states to saute the chopped green onion in the olive oil…What green onion? It is not listed in the ingredients!! The perfect meal as far as I’m concerned! And I’m a meat thermometer enthusiast too – once I started using one, my steaks and chickens have been perfect every. single. time. Love it. Your Surf & Turf dinner would be lovely for Valentine’s dinner at home! Thank you for the comprehensive explanations about the various cuts of beef. It’s confusing when one thing has several names! Looks like you’re going to make your husband a very happy man. 🙂 Surf and turf is a wonderful meal, but this blows the whole concept away. Fabulous dish! This looks prepared better than some restaurants. Such a gourmet dish. Love it! We love and good piece of meat and yummy shrimps in my house, and that I for the great cooking tips! What an amazing dish!! 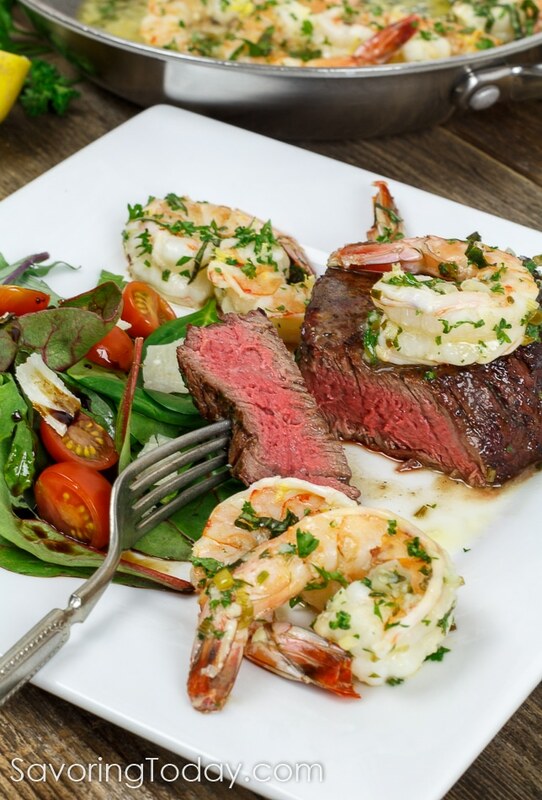 That steak looks perfect…and those shrimp! AMAZING! May well be giving this a go for valentines night! I love the steak tips! This looks like an incredible feast and perfect for Valentine’s Day! Delicious! I love how you included lesser known cuts, my absolute favourite steak cuts are bavette, hanger and flank! This is such a great date night at home! I wouldn’t want to leave! It reminds me of the Valentine’s meals my dad used to treat us to. Oh man, what a sweet dad! I appreciate all of the photos: they’re gorgeous, inspiring and instructive. What a beautiful and delicious meal!! Would be such a great Valentines meal for two and I love how you explain how to grill a perfect steak. Surf and turf is the ultimate date night meal! My hubby would adore this. Good heavens that looks amazing!!! My husband loves a good surf and turf! This steak looks mouthwatering! This looks awesome! Love when I can have 2 of my favorite things in one meal. Yes please! This looks SO good! My husband would love this meal. beautiful to look at, and my mouth is watering!! Looks SO delish! What a terrific dish! Luscious steak and rich seafood is such a terrific flavor combo. There’s a reason surf ‘n turf is a classic! Really informative post — just loaded with info. Thanks!